I could never be a chocolatier. Oh my love for chocolate is legendary, I can tell you that. I love to eat it, but making an actual food items that has to be dipped in chocolate is not something I enjoy, so what did I plan to make this week??? Two recipes that will need to be dipped in chocolate. What is wrong with me?? Why do I put myself through his kind of torture?? 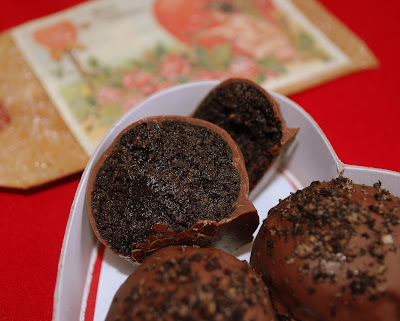 I know blogdom will be inundated with Oreo Truffle posts this week. I've already seen a few. So I jumped right on that bandwagon and dived into melted chocolate hell. This recipe comes from Bakerella, a woman who makes some of the most beautiful edible creations I have ever seen and obvisouly has much more patience than I ever will. Bless her chocolate dipping heart. Finely crush 7 cookies in a food processor or place them in a ziploc bag and crush into a fine consistency. Reserve for later. 7 was way too many. I only used a 1/4 of the crushed cookies as a topping. I also recommend using a food processor if you have one, it made for a perfect consistency. Crush remaining cookies and stir in softened cream cheese. Use the back of a large spoon to help mash the two together. Forget the spoon, just use your hands, it's much easier, messier, but easier. 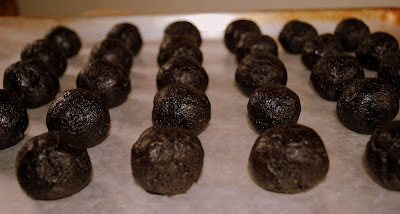 Roll the mixture into 1" balls and place on wax paper covered cookie sheet. On their way to the freezer. Melt chocolate as directed on the package and then dip balls into chocolate, tap off extra and set aside on wax paper covered cookie sheet to dry. You can sprinkle the tops with the 7 crushed cookies for decoration. I don't like using the "barks". I don't like the way they taste and I don't like how they melt. I had 2 batches seize up on me and two more that just didn't melt they way they should. If I ever make these again, I'm using semi-sweet chocolate chips (as you will see in my next Valentine recipe coming soon) I was frustrated and ready to just give up on the whole thing, but I trudged along. Once dry, refrigerate and enjoy! Makes about 36 truffles (only 30 for me). It helps to freeze the uncoated balls for a few minutes to keep the mixture from starting to fall apart in the melted chocolate. If this becomes a problem, dip them in the chocolate, let dry and then dip again. A few minutes is not enough time for these to freeze properly. I left mine in for a half hour and they still started to fall apart on me. The best thing is to work in small batches, keeping them in the freezer until you are ready to use them. Don't this this photo fool you. There was no love involved in the making of these truffles. The end result? Everyone loved them. I didn't touch one single one. I think I was so sick of chocolate and dipping and melting and re-melting that I couldn't bear to eat one. I did invest in one tool that made my chocolate dipping just a teeny, tiny bit more bearable.....a set of dipping tools from Wilton. The one I used the most looked like a long spoon with a hole in the middle. Each time I dipped, I tapped this tool on the side of the bowl and the excess chocolate could fall away. I made these Saturday afternoon and by Sunday afternoon there was not a one to be found. "You can make these again, I love them" Evan said. "Um ok" I said. I didn't have the heart to tell him not to hold his breath. You are my hero. I would have consumed mass quantities of all of it. I don't think most people would call it that hehe. You're funny, this whole post was amusing with your "yeah, yeah" approach. Still, awesome job Lisa. I could never do something like this. No patience. I'm hooked on your blog. This post is very amusing and your photo's...outstanding!! 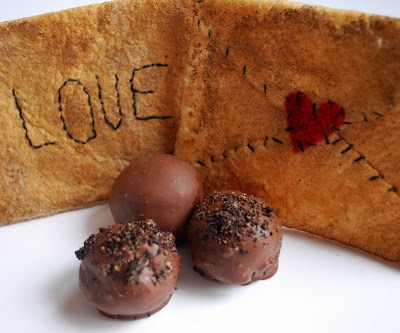 Oh, forgot to say that I'm making these tonight for a Valentine's party/fundraiser tomorrow. Thanks!